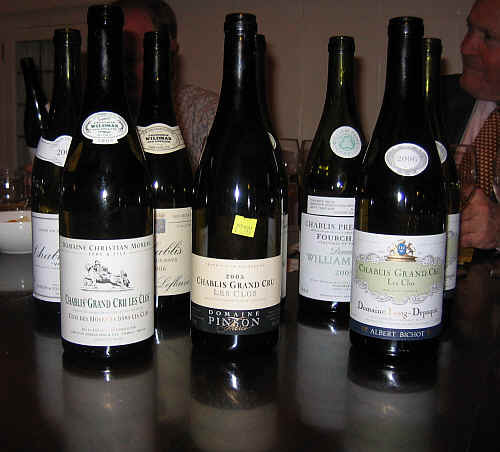 Chablis has certainly been an over-looked appellation and so the Vino Fino group had a look at a range of wines, from basic "Chablis" to a trio of Grand Cru bottlings from the same site, Les Clos. 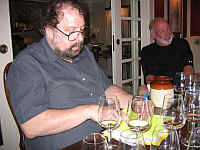 The wines came from the warm and ripe 2005 vintage, as well as the lean, somewhat more classic, minerally 2006 harvest. Chablis wines are noted for the stony minerality, coming from marl and chalk soils. This limestone has layers of what is called Kimmeridigian 'strats' which are said to be approximately, give or take 12 months, 240 million years old. 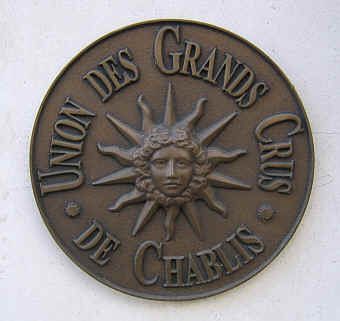 There are seven Grand Cru sites covering 100 hectares, while there are 767 hectares of Premier Cru vineyards. Yields in the Grand Crus are smaller, the combination of smaller production levels and best soils/terroir accounting for higher quality. Then there's basic Chablis which accounts for 3156 hectares of vines as of the 2006 vintage. The Petit Chablis appellation covers some 729 hectares and these are usually situated atop a plateau near "Chablis." We found one wine to be well ahead of the pack and yet two tasters (out of seven) ranked it very low. 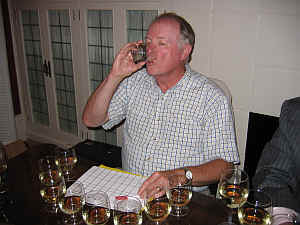 The last place wine managed to garner a third place vote from one taster (me! 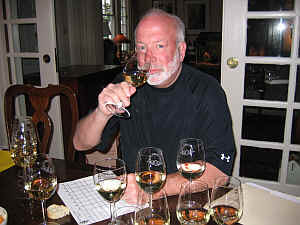 ), while the seventh place wine had a first place tally. Second place through sixth were separated by a mere 4 points. It was a terrific tasting, though. 8th Place: WILLIAM FEVRE 2005 CHABLIS 1er Cru "Fourchaume"
I had this ranked higher than anybody else, finding the wine to be quite typical of Chablis. 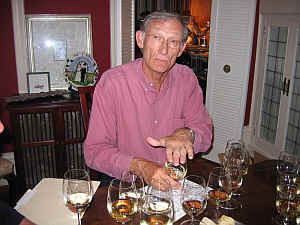 It showed a medium straw color and lovely stony notes on the nose along with a hint of orange peel. It's quite dry and mildly acidic on the palate. Medium-full bodied, this was a delicious Chablis with stony notes and a light woodsy tone on the palate. Very fine. I gave it one-and-a-half stars on my three star scale, no stars being an ordinary wine. I felt this was the only poor wine in the tasting. It struck me as significantly older than the rest of the wine in the flight, having a medium+ straw color and an odd, very honeyed fragrance. There was a hint of oxidation here, but mostly the honeyed character over-rode everything or anything else. It was better in the mouth, though, showing decent acidity and medium body. It was about what you'd expect, flavor-wise, a solid, simple, lightly stony dry white. No stars, though. 6th Place: SGUINOT-BORDET 2006 CHABLIS 1er Cru "Fourchaume"
Clear in appearance and straw in color, this showed a typically steely fragrance on the nose. It's quite dry and nicely acidic with stony, minerally flavors. Drying finish. A good bottle, but overshadowed by others in this line-up. One star. 5th Place: LAMBLIN 2006 CHABLIS 1er Cru "Vaillon"
Medium straw in color, Lamblin's Chablis offered green apple fragrances along with some stony tones on the nose. It's dry and appropriately acidic. Medium-bodied, the apple character comes through on the palate. It's a bit more 'fruity' than most of the others, but not in a sweet sense; it simply has more 'fruit'. Good wine. One star. 4th Place: OLIVIER LEFLAIVE 2006 CHABLIS "Deux Rives"
Leflaive is a negociant firm and they buy grapes from both sides of the Serein river to make this simple, rather typical Chablis. It offers a hint of the flinty, stony notes we expect in this wine. It's dry, crisp and lightly appley. Not especially long on the palate, but it's nice as far as it goes. One-and-a-half stars. It over-performs for being a 'simple' Chablis. 3rd Place: LONG-DEPAQUIT 2006 CHABLIS Grand Cru "Les Clos"
Medium+ straw in color, this has a hint of a woodsy element on the nose and is lightly oaked. It's dry and moderately acidic, with medium+ body. Mouth-drying, tangy and crisp, it's a very good example of Chablis, but perhaps needs a bit more time to blossom into a wine worthy of 'grand cru' status. One-and-a-half stars at this stage. 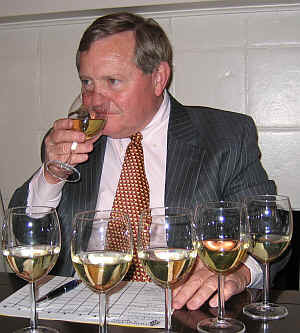 2nd Place: DOMAINE PINSON 2005 CHABLIS Grand Cru "Les Clos"
Medium+ straw in color, this had a really enchanting nose. There's some toasty oak but also a complex, leesy element giving additional smoky notes. It's dry and medium-bodied. The wine has a nice texture on the palate, a steely quality but also an element of intensity. There's a nice, long finish here as well. It's really showing well now and should be great for several more years. Very fine! Two stars+. 1st Place: CHRISTIAN MOREAU 2005 CHABLIS Grand Cru "Les Clos"
The most costly wine in the tasting, but also the group's favorite wine, Moreau's Grand Cru bottling from Les Clos has medium+ straw color. There's a woodsy, oaky, toasty note, but the steely elements of Chablis are present, too. It's dry and moderately acidic. Medium-full on the palate, there's plenty of depth here, with stony flavors and a long finish. Very fine. Two stars+ and this should continue to develop for a number of years.